I tend to have a problem with completion. I’m an all-or-nothing type of girl; if I can’t complete it, or can’t have it completely, I think I might as well not bother. I’d rather skip the journey and get right to the destination. And yet, I have an embarrassing number of projects in various stages of un-finish in my house (and in my life). But if there is anything at all I’m learning about the Creator of the Universe, it’s that he’s much more interested in the process than he is in the finished product. Obviously, God does not snap his fingers and make us perfect – at least from our perspective. It’s really not about the end result; God already sees that. The cross accomplished that for us: the cross has made believers holy and perfect in God’s sight. It’s about the process, the becoming. It’s about God working in us through Christ. Redemption is instantaneous, but it’s also never finished this side of heaven. We are continually being remade in the image of Christ. If you’re a believer, you’re a new creation (2 Corinthians 5:17). He started something in you the moment you confessed with your mouth and believed in your heart that Jesus is Lord (Romans 10:9). You are not, however, a finished creation. But take heart! 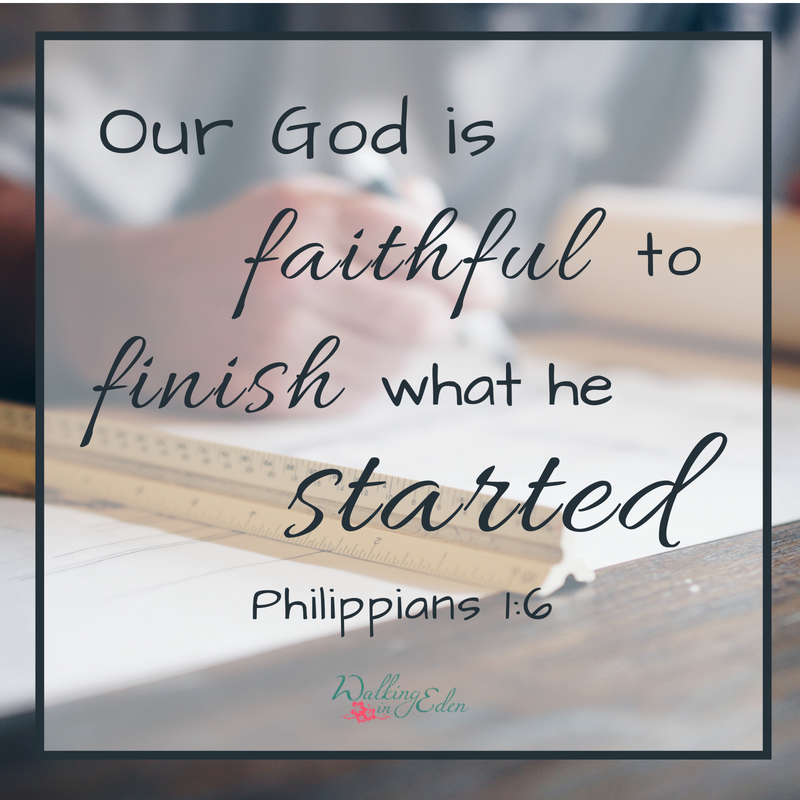 “…he who began a good work in you will bring it to completion at the day of Jesus Christ.” ~ Philippians 1:6b. We won’t be finished until we’re home in heaven. Here on Earth we’re a work in progress. God’s purposes in doing it this way are a mystery to me – except that I believe it goes back to free will, God giving us choice. The only way to completion, while still being creatures of choice, is to take the hard journey. But God called us to this! We were made for it before our birth: chosen, predestined. So we don’t need to worry about our progress (unless of course we’re ignoring his lead). If we’re obeying, we’re where we need to be. When we obey, we’re “remaining in him”. This is what it means to abide! The journey is not meant to be impossible, or even a burden – Jesus promises he shares the burden with us (because of course the journey can and will be hard). But he is the vine from which we draw our life. He supports us, guides us, works in us. Jesus is vine, we are branches. We bear much fruit if we are in him. Nothing apart from him. And I am sure of this, that he who began a good work in you will bring it to completion at the day of Jesus Christ. These truths are such beauty to me. When I get anxious about my path, my progress, my future, I can rest in these promises. It’s not about the end – Jesus did that work, so the end is already perfect! It’s about the getting there. Yes, Jesus did all the work for us! It’s sometimes easy to fall down the path of the world instead of our Lord! Remember his sacrifice and listen to his guiding words. 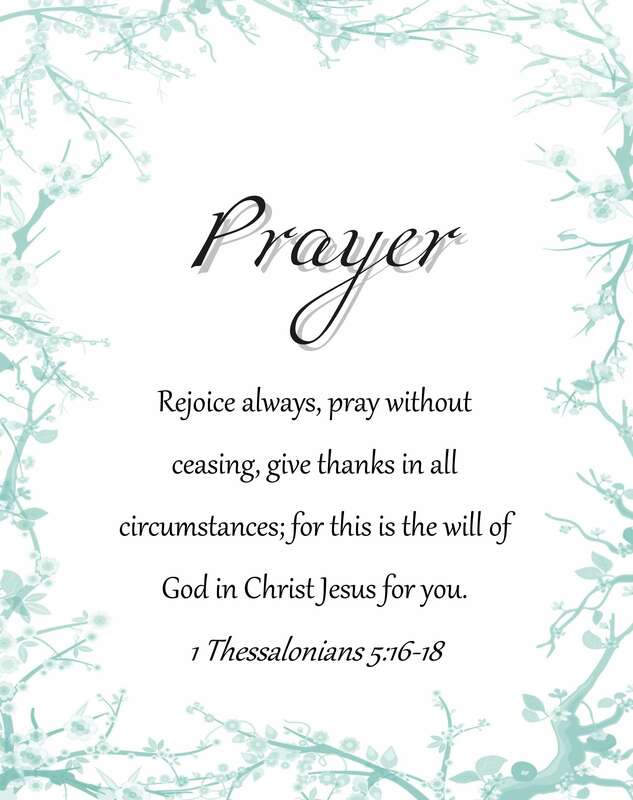 God is good and is always there. Thank you for another well written blog Jennifer!